Dahlia Drive » DD At The Vancouver Art Gallery! DD At The Vancouver Art Gallery! The VAG loved me soooo much during the Leonardo da Vinci exhibit that they just had to have me back for their new Modern Women themed exhibit! I currently have T shirts, scarves, slips and yes even bags in their gift shop. Next time you’re downtown why don’t you pop in and check me out… I dare ya! This is an ongoing project and my most exciting to date. I love Chagall and am intrigued by the translucent colours I can create with disperse dyes on paper so I have decided to paint Chagall’s 12 Jerusalem windows. Each window has 12 panes and each pane is painted to fit a slip. I have finished the 12 panes of Issachar and have transferred those paintings onto 12 slips. Together, they create the entire window of Issachar. I mixed a specific palette since the dyes do not represent their colour until heated and painted it freehand. 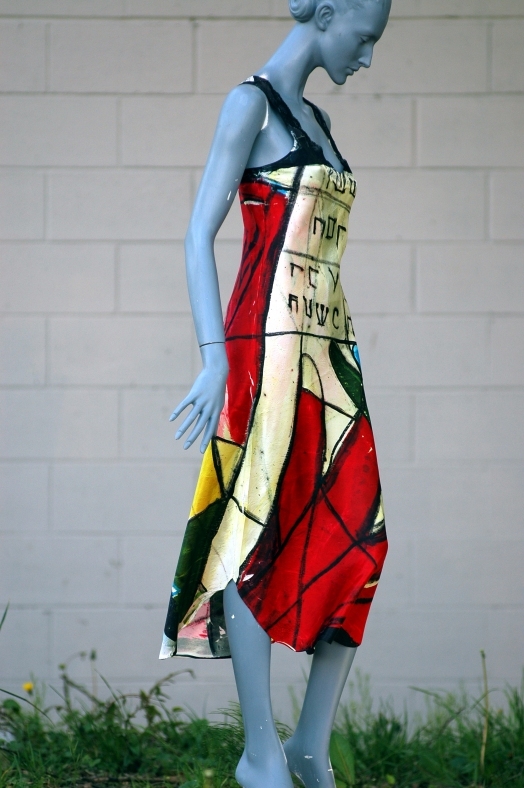 The Biblical story, the translucence of stained glass, the joy of Chagall, the temple of the church all wrapped on a woman’s slip is, to me, delightful. Only 132 more to go!